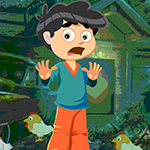 G4K Fearful Boy Rescue Game is another point & click escape game developed by Games4King. There was a small village in a beautiful magnificent country. A fearful boy lived in that village. That fearful boy was unexpectedly stuck in a house in a day. It is your duty to save the fearful boy from there by finding clues and solving puzzles. Good Luck and have fun! Bug alarm! Place pigs on its places as you find them. Other way you'll finally get 4 of them instead of 5. For the oldtimerfans: It's an American Cadillac 1951 and a German Ford Taunus 1969.